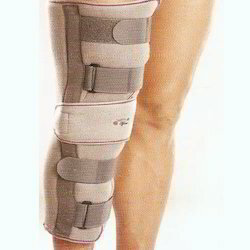 Leading Wholesale Supplier of knee cap with patellar ring, knee cap, knee cap rigid hinge, pattelar support, knee cap comfeel and knee immobilizer 22 from Chandigarh. quick healing. Three dimensional knit provides anatomical shape, strong compression & comfort. Dermophiiiic cotton ensures comfort in all weather conditions. Nylon outside ensures durability & aesthetics. Thick knit provides therapeutic warmth. Strong aluminum hinges provide rigid side splinting & free flexion movement. 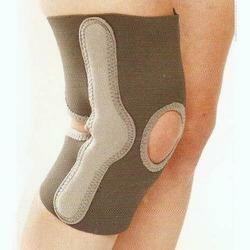 Open patella with cushion, release the patellar pressure, improves comfort. 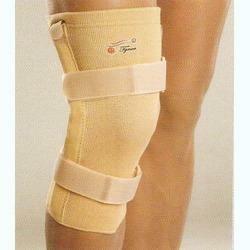 Can be used for Patello - femoral problems. 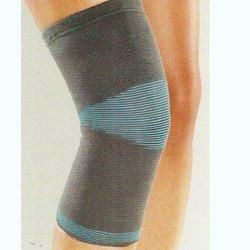 Wrap design allows customized compression and easy application on swollen, geriatric or asymmetric knees. Large dorsai opening ensures no buckling or vaso constriction. Bi-layered construction, dermophillic cotton ensures, comfort in all weather conditions. Nylon outside ensures long life, excellent aesthetics and color fastness. Strong hinges provide rigid side splinting and free flexion movement. Anti tourniquet strapping, provide better grip and ensure no blood constriction as well. Anatomical pad design lifts and positions the patella properly,Provides optimal compression to the patellar tendon in patello-femora problems. Silicon pad grips & absorbs the vibrations. Nodular surface provides good massage, proprioception & quick healing. Reverse buckle design allows customized compression One size fits all. Anatomically shaped with "reduced compression spot" ensures no patellar pressure. Three dimensional knitting provides anatomical shape, snug fitting & strong compression. Bi-layered construction. Dermophillic cotton ensures, comfort in all weather conditions. Nylon outside ensures durability excellent aesthetics & color fastness. Thick knit retains therapeutic warmth & provides assuring support. Anatomically contoured aluminum splints ensure perfect immobilization & grip, enhanced comfort and no hot spots. Body of PUF fused fabric ensures proper cushioning, enhanced comfort, long life & anti slip properties. 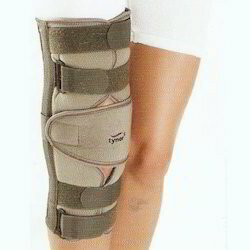 Removable patellar strap improves immobilization further. Light weight, aesthetically smart, improves comfort and compliance. 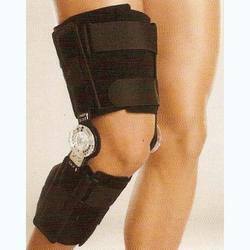 s per the requirements of the customers, we are involved in offering best quality of Knee Immobilizers. These Knee Immobilizers are extensively used after surgery to help prevent unwanted movement that could re-injure the leg. Moreover, the offered products to customers at market leading prices. High density liner foam with quick release buckle. Provides comfort and is easy to use. Quick lock fix the angle easily with range of motions from 00 to1200 of flexion and 00 to 900 of extension. 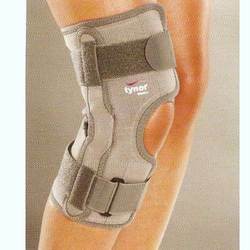 Ideal for Immobilization and protected range of motion associated with ACL, PCL, LCL & MCL. Bi axial heavy duty hinge ensures weight bearing & free flexion movement. Four way stretchable fabric offers comfortable compression & no buckling. 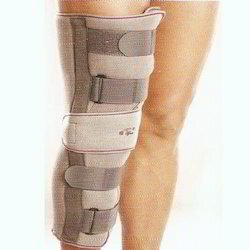 Wrap design with anterior closing ensure customized compression, easy application on swollen or geriatric knees. Anti tourniquet strapping ensures snug grip, but no blood constriction. Open patella design, can be used for patello -femoral diseases. 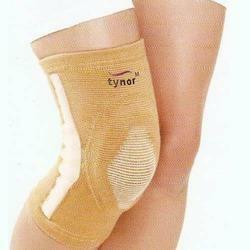 Looking for Knee Supports ?